I’ve been thinking about power lately. When you’re dealing with pedals, power is always an issue. Just when you get it figured out, another pedal comes into the line, and things change. Clean power is important. Daisy chains are good, but can be a problem, especially if you have finicky pedals. Pedaltrain came out with a great new solution last year (won best-in-show for Summer NAMM 2013) with their Pedaltrain Volto. This is smart. Very smart. Here the brainiacs at Pedaltrain use a Lithium Ion rechargeable battery for a power supply. Basically, the same type of power supply your laptop or smart phone uses. It’s small and very light weight. First concerns I had – how long does it last? I was stoked that it can run 30+ hours loaded with 9V pedals. Second concern – how to recharge? Again, like smartphones, you can plug this in via adapter to a wall, or direct to a laptop, etc with the cable. The cable is a USB to mini-usb cable. Standard type of cable. Third concern – what happens if you’re low on charge, but need to play right now? Again, they have it figured out, you can plug it in and use while it’s charging. Issues. As far as I know, it can only power 9V. The small profile allows it to fit on almost any pedal boards. For myself, I have to break out a daisy chain to power a partial set of pedals on my board (primary power is Voodoo Lab), so this could be a great ‘clean’ solution to power the others and break out of the chain. Gears. Are. Turning. 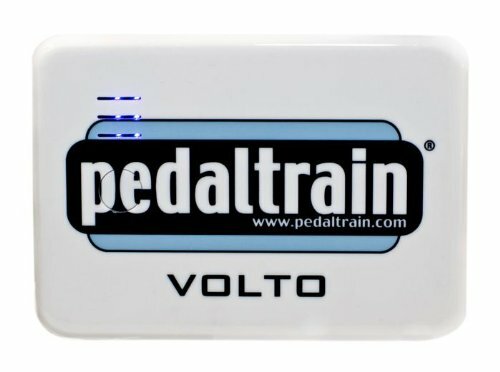 The Pedaltrain Volto is available for only $99. I think this is a great purchase!!! If you have one? Let us know what you think by commenting below! I’ve had one for about three months now. I’ve used it at a ton of gis, multi set show and rehearsals. For someone who plays in clubs this thing is a godsend. I don’t need to worry about where the electricity source is, can be more flexible with my placement on crapped stages and don’t need to worry about the bass player tripping on another power cord. So far no problems. I don’t know about the 30 hours or life per charge though. I bought one of these about 7 months ago after having seen it mentioned on effects bay. I’ve used it for several rehearsals & shows & it’s never let me down. No need to worry about running power leads to the board or putting the board wherever you want / need / have to. It doesn’t last for 30 hours though…at the most you’re looking at about 8hrs. I have one, and I love it. I’ve used it at rehearsals and gigs. It’s great not having to worry about another power cord onstage. AND, here’s a trick for charging them. you can use a portable USB charger, like ones marketed for cell phones. Reddit has a thread about it.